Home › Technical Analysis › Chart Analyses › CBA Revisited. ?Undergoing a change in trend. CBA Revisited. ?Undergoing a change in trend. This is a basic candlestick chart of the Commonwealth Bank of Australia, Australia’s largest bank. 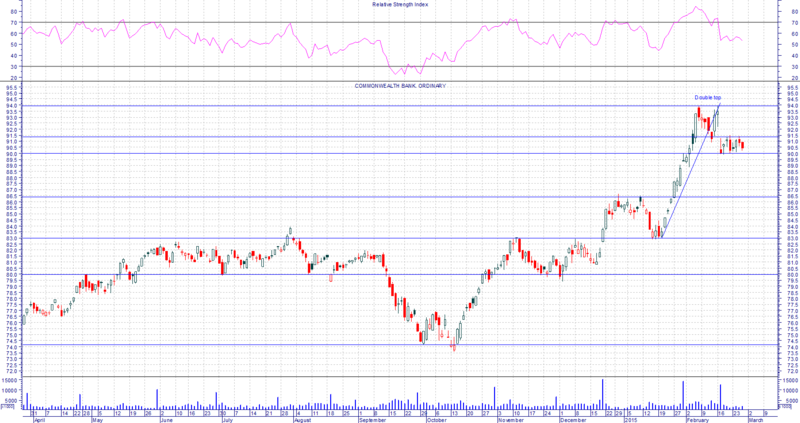 It is a daily chart extending back over the past eleven months that features a number of support and resistance levels. This post takes another look at CBA’s chart after a strong upwards impulsive move which lifted the share price by an amazing $20 (from $74 to $94) in just six weeks. Instead of then transitioning into a corrective move lower, the share-price has formed a double top at $94 before drifting lower to now trade in a range between $90 and $91.50. Double-top (or bottom) patterns are commonly associated with changes in trend. They should not be taken in isolation however. The price action before and after is equally significant. Chartists will pay close attention to the way the current trading range terminates. A break-out to the upside would be a preamble to the share-price re-testing resistance at $94, and perhaps continuing the uptrend higher towards $100. Break-out to the down-side would provide confirmation of a change in trend and suggest the possibility of lower prices for CBA. In this event the next support level would be at $86.50. This post is for general information only and should not be regarded as providing investment advice. ‹ MJP – Up and flying!